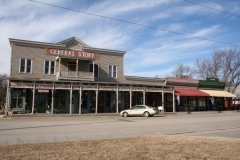 Alma's central business district is located along Highway 99 on Missouri Street between Second and Fifth Streets, and is characterized by two-story stone and brick commercial buildings from the late 19th and early 20th centuries. 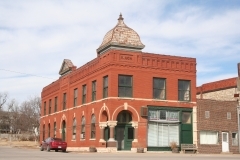 The architectural character of the downtown was largely defined after 1887 when the Rock Island railroad built its main line along the southern edge of town and includes Italianate, Romanesque, and Commercial styles. 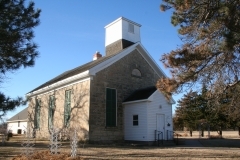 Nearby stone quarries provided much of the building material for Alma's turn-of-the-century historic resources, and even today the town is known as "the city of native stone". The district is locally significant for its architecture and its reflection of the community's commercial building patterns associated with the economic growth when the town flourished as a rural railroad market center and county seat during the late 19th and early 20th centuries. 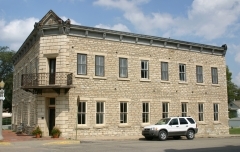 Built in 1887 by Joseph and Cristena Brandt, the Brandt Hotel is a two-story native stone commercial building located on a prominent corner in downtown Alma. 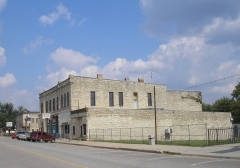 The building is nominated for its associations with the development of downtown Alma and its architectural significance. The building's Italianate-style features include an ornamental pressed metal cornice and smooth-cut stone blocks that accentuate the corner entrance to form quoins. The idea for a recreational lake in Wabaunsee County was conceived in the 1920s and - with the help of Federal New Deal programs - finally became a reality in the late 1930s. Lake Wabaunsee's grand opening was held on August 26, 1939. A single paved roadway encircles the New Deal-era lake and includes two historic stone arch bridges. The construction of the three-arch stone bridge took place in 1937 and 1938 and was funded by the Works Progress Administration. 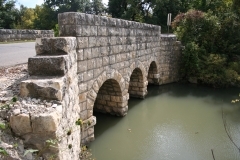 The bridge is nominated to the National Register as part of the "Masonry Arch Bridges of Kansas" and "New Deal-Era Resources of Kansas" multiple property listings. Today, lakefront houses dating from the middle and late 20th century dot the perimeter. New Deal-era camp buildings are no longer extant and modern development prevents listing the entire lake site in the National Register. The East Bridge remains an integral part of the historic road system encircling Lake Wabaunsee. The Eskridge City Park & Bandstand, built between June 1908 and March 1909, was nominated under Criterion A for its local significance in the area of Entertainment/Recreation. 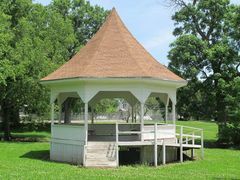 Standing in the approximate center of Eskridge City Park (established in 1903), the bandstand is the park's focal structure. The park and bandstand are associated with the most vigorous period of economic growth and community development in the history of Eskridge. Built primarily for use for the city band, the bandstand has a long history of use for other public and private social events, including Chautauquas, carnivals, city fairs, graduations, baccalaureates, and weddings. The period of significance begins with its construction in 1908 and extends to 1966, the 50-year convention to provide sufficient passage of time to evaluate eligibility. 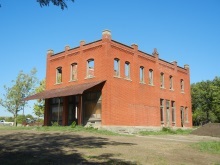 Brothers Bill and Otto Kratzer constructed this building in 1913 at a cost of $8,000 to house their general store, which served as the commercial center of Volland until it closed 1970. The development of Volland and the Kratzer Brothers store also reflects the railroad history of Wabaunsee County and the summer pasturing industry that developed in the area. 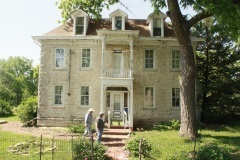 Volland prospered in the early 20th century as a shipping point on the Chicago, Rock Island, and Pacific Railroad for Texas cattle fattened on the prairie grass of Wabaunsee County pastures. Generally, the economy of Volland and its surrounding trade area was based on small-scale diversified farming and stock-raising. The area began to decline in the 1960s when the cattle-shipping industry bypassed Volland, and today only a few structures remain in the unincorporated village.